It’s official, today is the FIRST DAY OF SUMMER!! It was touch and go there for awhile here on the east coast in April and May with our ridiculously cold weather. But, Mother Nature has finally delivered this week with beautiful sunny 80-90 degree days. Now that Summer is officially here and the kids are out of school, it’s time for some easy, bright, sunny, Summer Recipes. It’s time for Talking Top Easy Summer Recipes! 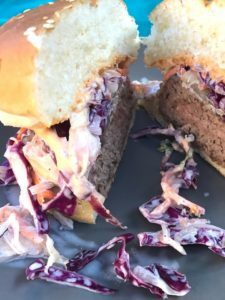 While I like a good hamburger or hotdog as much as the next person, I really try to find more interesting summer recipes. However, for me, interesting can never mean complex. 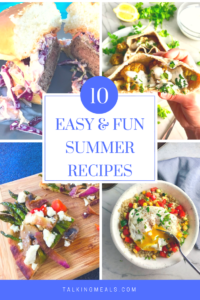 These recipes are delicious, fun, easy, interesting and unique, and sometimes messy because that is what Summer is about! Hello, Beautiful! 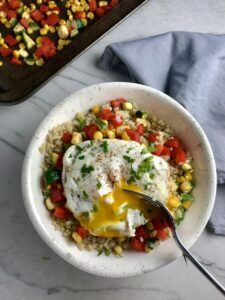 This Sunny Quinoa with Fried Egg & Veggie Medley looks like summer in a bowl! With only 6 ingredients, it’s so simple, but incredible because the combination of flavors is just perfect together. The veggie medley of corn, zucchini, and red pepper is bright and fresh and full of sweetness that bursts in your mouth. And if you have never had a fried egg with the yoke oozing over your rice or pasta or, in this case, quinoa, you are missing out and have gotta try this. 😎 The yoke brings a natural creaminess to the dish that you just cannot get from anything else. Summer food doesn’t always have to be grilled or cold. 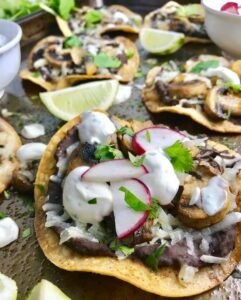 Just picture this…you’re sitting outside sipping on a margarita with friends and family while your perfect Mushroom & Black Bean Tostadas cook in the oven in the house. The oven timer goes off, you pull out the perfect outdoor casual finger food. Yum! When I think of Summer, I think of salads. 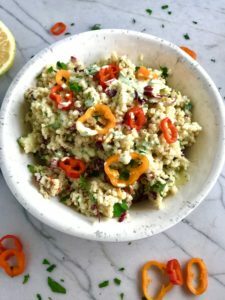 But, salads don’t just need to be greens, this Veggie Quinoa Salad with Lemon Dressing is a cool, refreshing, but filling and delicious salad that can stand alone or be a great side dish. It has so many fresh and flavorful vegetables including cucumber, sweet peppers, radicchio, scallions, and parsley. The dressing is a bright Creamy Lemon Dressing with Lemon, honey, mustard, and sour cream. You can also make a huge batch of this and portion out for lunches and eat all week! 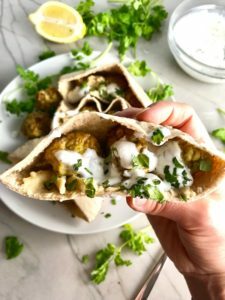 This Moroccan Meatball Stuffed Pita recipe reminds me of Summer street fair food. In New York we have street fairs that pop up in the summer every weekend on a new block. You get local artists and food vendors selling their goods and there is always the stuffed pitas that you just cannot pass up. These are an easy and delicious version that will expand your culinary horizons but also keep-it-real by getting in there with your hands and getting as messy as you want – so, these are great for eating in the back yard! Going to a potluck picnic and need to bring a salad that is easy, but will still WOW people? This Potluck Salad with Herb Parmesan Crisps is it! 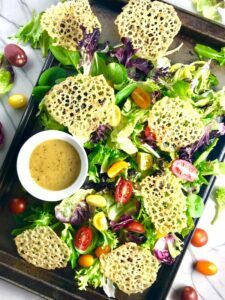 This is a super simple salad with homemade Honey Shallot Vinaigrette and buzz-worthy Herb Parmesan Crisps that take the place of the crouton crunch. The Vinaigrette is sweet from the honey, tangy from the dijon and vinegar, creamy from the emulsion of the dijon and oil, and has a slight bite from the mild shallots. 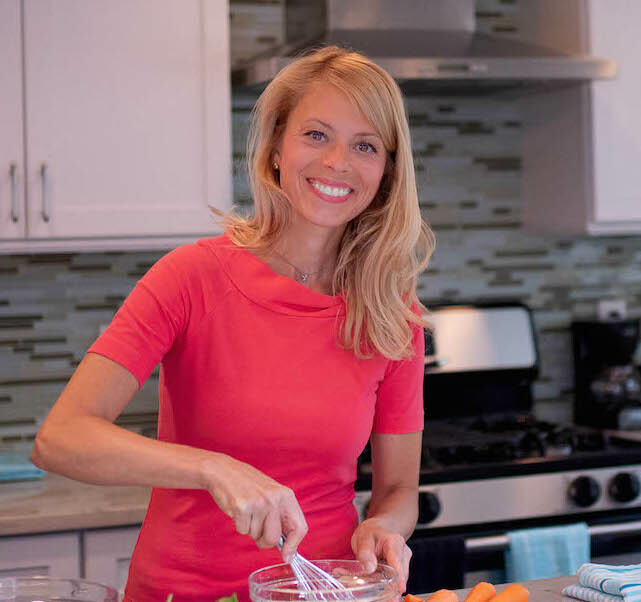 But the real hero of the dish, the ingredient that will have the guests asking who made this wonderful Potluck Salad, are the Herb Parmesan Crisps, which are salty and nutty and crispy and delicious and addictive…oh, and so easy to make you will not believe it! I mean c’mon, it has ‘Summer’ in the name! But really, aside from the name, these are really a wonderful Summer treat to make for lunch, appetizers, or dinner. They are also tons of fun for kids to help with! 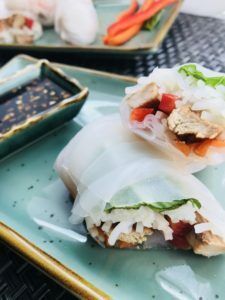 These Chicken Summer Rolls start with Teriyaki Chicken strips, Rice noodles, carrots, red pepper, and basil. All get rolled up in a light moistened rice paper. What you get is this bite of freshness that you dip into the sweet, tangy, and salty Garlic Honey Soy Sauce. These are a Summer delight! Summer is the time for Farmers Markets and what better way to use those fresh local veggies and cheeses than on a Flatbread. 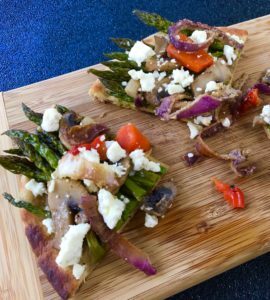 This flatbread recipe combines Asparagus, Mushrooms, Red Pepper, Onion, and Feta Cheese on a crisp flatbread. The great thing about this recipe is that you can roast or grill the veggies and the flatbread. Plus, you can change up the veggies and the cheese to be whatever you want! 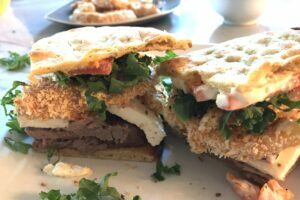 In keeping with the flatbread theme, the next recipe on the list is this de-li-cious Steak, Feta, Kale, & Crispy Onion Sandwich. While the grilled flank steak is pretty amazing, the crispy onions in this sandwich really steal the show. And seriously, what is better than eating a messy loaded sandwich outside? This sandwich has so many flavors and textures piled on between 2 crispy pieces of flatbread. The tender flank steak, topped with crisp kale, topped with creamy and salty Feta, topped with tangy and sweet roasted red pepper, topped with Crispy savory onion rings, topped with another salty layer of garlic aioli that comes oozing out with each bit WILL fit in your mouth and you will LOVE it! When I think of Summer, I think of gardens of fresh herbs and bright beautiful lemons. 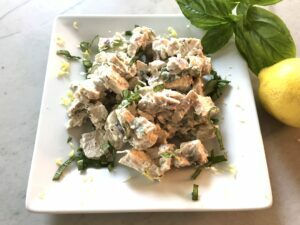 This Sunny Lemon Basil Chicken Salad brings those Summer images together in one deliciously simple recipe. With a lemon basil creamy dressing mixed into the chicken, it’s fresh, light, but full of flavor. It’s also a great way to use up leftover chicken. You get the brightness from the lemon, the fresh and fragrant basil, and a slight bite from the onion….so yummy! 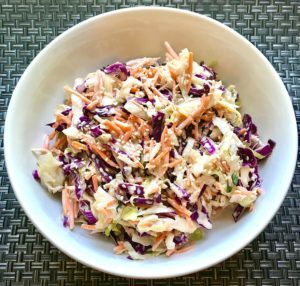 Last but not least on the list is none other than the Super Summer Salad Recipe: COLESLAW! But…this is no ordinary slaw, this is a Super Sidekick Sesame Slaw (Asian Coleslaw) with the crunchy textures from the cabbage and carrots, slight bite from the scallions, creaminess from the mayonnaise, and the nutty flavor from the Soy, Sesame Oil, & Sesame Seeds. It really is a sidekick that can go with anything. It is delicious on its own as a side, topped on top of a burger or grilled cheese or chicken sandwich, mixed into a Chicken salad, topped on top of a greens salad, or on top of a tomato soup! What are YOUR favorite Summer recipes? Please share in the comments!